Who knew indie publishing could be this much fun? Whether you have already published or are contemplating your first book, Pamela Fagan Hutchins makes an overwhelming field manageable by presenting tried and true how-tos and a myriad of resources, including the marketing plan that got her debut novel national distribution - all with her tongue firmly planted in her cheek. 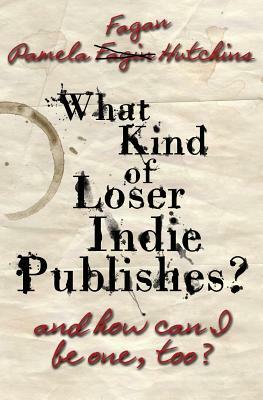 What people are saying about What Kind of Loser Indie Publishes, and How Can I Be One, Too? "Sharp, practical, and a pleasure to read, this is an indispensable tool for indie writers. Hutchins maps the shortest distance between you and your readers. You need this book " - Mark Moore, writer and editor "Sassy, brassy, can-do voice. It's very inspiring." - Martin Turnbull, author of The Garden of Allah novels "Fabulous Dozens and dozens of great suggestions and resources. Indie writers are going to LOVE this book, not only for its insights, but for Pamela's witty personality." - Jennifer Meils, writer, editor, and journalism teacher "Loser is so packed full of useful, important information, it will become the Bible of indie publishing. As always, Pamela's wit and humor shines throughout. Definitely a must-have for any author." - Rhonda Erb, writer and editor "Awesome information; very well written." - Fernanda Brady, writer and English teacher.